Cross section through the left ventricle of a mouse heart. The heart consists of four chambers through which blood flows. Cardiac (heart) muscle is organised in spiralling fibres which transition smoothly between a left handed spiral on the outside wall of the left ventricle to a right handed spiral on the inside. This helical structure helps the wall of the heart chamber contract in order to pump oxygenated blood out of the heart and around the body. Also visible are the two large, left ventricular papillary muscles (thick downward stretching fibres). These hold the contracted chamber in place and help maintain tension to prevent blood moving backwards through the heart in the wrong direction. This image was created using Optical Projection Tomography (OPT) which uses ultraviolet (UV) light to excite the natural autofluorescence in the tissue. In order to detect this autofluorescence, the sample is first made transparent using chemical processes. To build the final image, the sample is rotated about its axis and a series of images are taken which are then used to create a 3D model of the object. 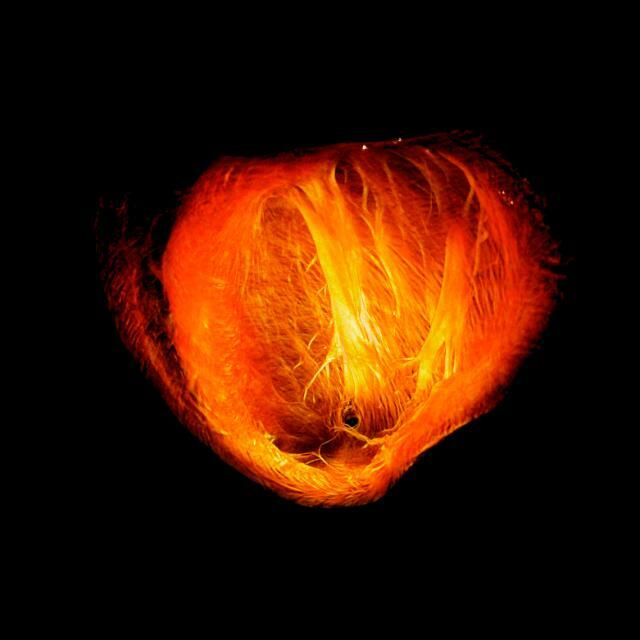 This reveals the microstructure of the heart tissue and gives insights into the mechanical function of a healthy heart. Diameter of the heart chamber is approximately 800 micrometres.